Bennett Winch has heard the call of the frequent traveller, creating a suit carrier holdall that is at once practical, functional and decidedly sophisticated. When one considers that there are approximately 480 million business trips made every year, one wonders in what state these intrepid corporate travellers arrive at their meetings in. Given that even the most diligently folded clothes emerge looking crumpled after shuttling about from hub to hub in an aluminium tube at 36,000ft, travelling with a suit in a bag really isn't acceptable, particularly when busy business schedules won't allow for pressing of said suit on arrival. The increasing prevalence of travel-specific suits with high-twist yarns that spring back to shape is at least one saving grace for capitalism’s sartorial day-trippers, but for those with a proclivity for finer cloths and further fields, the only option is a cumbersome suit carrier. 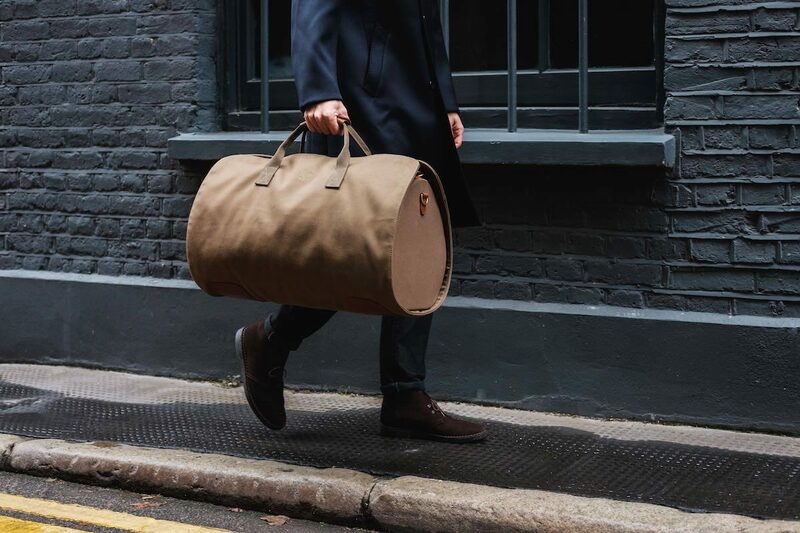 That is until British handmade luggage maker Bennett Winch put its collective design heads together with Simon Crompton, the founder of Permanentstyle.com and renowned arbiter of all things sartorial. Together they fashioned a solution to this perennial problem: a waterproof canvas holdall as novel and effective as it is elegant thanks to a suit carrier which neatly wraps around the central, cylindrical bag, attaching to it with magnets and straps. Since both are made from canvas and have minimal structure, they can be carried as one bag without being too heavy, while also being used separately, such as at one’s destination when the suit carrier becomes surplus to requirements. Given that their solution now consisted of two bags rather than one, Bennett Winch used a lighter 18oz cotton twill so that while the holdall had the requisite strength to maintain its shape, it was still a comfortable carrying weight when packed full. Indeed, our experience with the British brand’s products has been nothing less than outstanding, as one would expect for a company that prides itself on handmade craft and attention to detail, as evidenced by the vegetable-tanned full-grain leather panels on the bottom of the bag and solid brass hardware throughout. Available in black and olive versions, the S.C holdall also comes with its own slimline wooden hanger, designed to accommodate one jacket and one pair of trousers so you always arrive at your destination ready to look the business. Forget Virgin, British Airways or Singapore Airlines: Bennett Winch is our carrier of choice.